According to P. H. Combs in The American Book of the Dog, when the breed was first being developed, “almost anything in the shape of a Terrier having a long coat with blue on the body and fawn or silver coloured head and legs, with tail docked and ears trimmed, was received and admired as a Yorkshire Terrier." Later, the breed underwent more refinement, much of which was accomplished around Yorkshire in England, which is why the breed sports the location’s name, and included a show dog named Huddersfield Ben, who was owned by Mary Ann Foster, and who won many competitions as both a show dog and a ratter. Huddersfield Ben is considered the foundation stock of the breed, and a dog that sired many consistent puppies during his short lifespan and helped solidify the Yorkie standard. 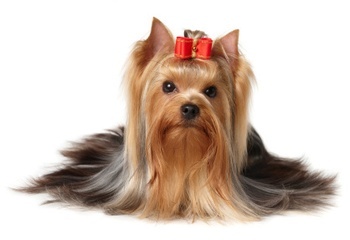 The coat of the Yorkie is of utmost importance, with many fine details of shades and markings in the standard. Those include: “color of hair on body and richness of tan on head and legs are of prime importance in adult dogs, to which the following color requirements apply: Blue: Is a dark steel-blue, not a silver-blue and not mingled with fawn, bronzy or black hairs. Tan: All tan hair is darker at the roots than in the middle, shading to still lighter tan at the tips. There should be no sooty or black hair intermingled with any of the tan. The blue extends over the body from back of neck to root of tail. Hair on tail is a darker blue, especially at end of tail.” The Yorkies coat, while strictly defined by color and markings, can be kept long for show dogs or clipped for easier care of pet dogs. While Yorkies started out in the blue-collar homes of textile-mill workers, they quickly became popular in the hearts and homes of middle- and upper-class families as companion and show dogs. With their past as a ratter, they’re confident, active dogs with a protective streak. They’ll bark at strangers but also love being the center of attention and will sit on your lap for hours. Stanley Coren ranks them as the 27th most intelligent dog in his book The Intelligence of Dogs. As small dogs, Yorkies typically enjoy a long lifespan, averaging 17-20 years. They do however suffer from several medical issues, including digestive issues, cataracts and other eye problems, liver complications and structural problems. At Paw Print Genetics, we offer a panel test that includes screening for three genetic mutations: alopecia, primary lens luxation and PRA-PRCD. If you order a panel test that includes all three diseases by Oct. 20, 2013, you can receive 15-percent off the cost of the order by using the code “FBYORK” at checkout.